The aix is an implement that haes been uised for millennia tae shape, split an cut wid; tae hairst timmer; as a wappen; an as a ceremonial or heraldic seembol. 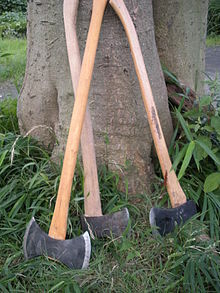 The axe haes mony forms an specialised uises but generally conseests o an aix heid wi a haundle, or helve. This page wis last eeditit on 23 Apryle 2017, at 03:31.